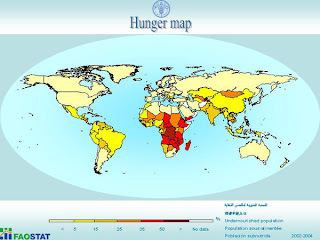 Nov 21 2007 - Chronic famine is steadily creeping ever-closer to South Africa - the only country in southern Africa where commercial crops are still being produced on a professional scale. With 4million South Africans now needing emergency food aid - including 1-million Afrikaner whites -- the spectre of chronic famine -- a constant in the rest of Africa is beginning to loom large. For the first time in its modern agricultural history, SA's grain silos have run dry two months before the start of the harvest season. The Mbeki regime is leaving commercial farmers with far too few land-holdings to grow food crops on: less than 1% of the country's entire surface area is now used for permanent crop-farming according to CIA satellite observations. In spite of the burgeoning food prices and growing shortages inside SA, the Mbeki-regime is nevertheless still continuing its disastrous Mugabe-style 'land-reform', which in neighbouring Zimbabwe has caused out-and-out famine, with millions of desperately hungry people stripping the countryside of anything edible. Yet the SA regime still continues to lie about the total land-surface still being utilised by 'white' commercial farmers, saying that '85% of the country is used for agriculture and forestry'. This has NEVER been the case in SA's entire agricultural history. The country is so dry that in fact only 12.1% of the entire South African land-surface has ever been arable at all -- i.e. useable by crop-growing activities. This downright ANC-lie -- designed only to sweep up the homeless black population in the country's burgeoning shanty towns against the country's few remaining white farmers -- can be easily disproven from direct satellite observation records and from SA's own 2005 tax-base. According to the latest CIA factbook on South Africa - which obtains its agricultural-use surveys from its direct daily satellite observations -- only 14,980 square kilometres of SA's total 1,219,9122 square km of land surface were actually used as irrigated land last year. And while the country's total arable (i.e. useable for agriculture) land was only 12.1 % according to the CIA -- only 0.79% of this land was actually seen from space as being used for growing permanent (i.e. commercial) crops last year. This means that many thousands of former commercial lands are now lying fallow. This very poor utilisation even of available agricultural land actually supports the SA government's own 2005 tax records, which show that South Africa only had 13,200 commercial, (white) taxpaying farmers that year producing excess crops and paying payroll- and income taxes. The country also has some 100,000 'emergent black farmers' on the tax-records who however paid no taxes at all - neither payroll nor income taxes -- and had produced no excess crops for the market, consuming their entire production themselves with their live-in extended families, who work for them for free. In other words, these 13,200 commercial Afrikaner farmers (their number has become even less by 2007) only had the use of 0.79% of South Africa's entire surface of 1,219,9122 square km to grow the country's entire food supply on. They also are the second-highest employer-group in the country -- employing some 650,000 of the country's 16-million employable workforce on a fulltime and parttime basis combined. The Mbeki-regime is now deliberately destroying this entire commercial-agricultural taxbase for purely racist reasons. The CIA Factbook also noted that a whopping 50% of the country's 43-m people (CIA stats for 2006)-- i.e. more than 21,5-million people, including 1-million Afrikaner whites -- lived below the poverty line of $1 a day by last year and that the population's actual growth rate had dropped to 0.40% due to the AIDS epidemic. The only reason the population still was growing was the large migration pattern from the rest of Africa. The child-mortality rates and death rates among young adults due to TB+AIDS have gone through the ceiling. Yet in spite of its self-proclaimed 'economic growth' -- caused mainly by its massive exports of unprocessed, raw materials such as uranium, platinum, coal and gold -- South Africa for some reason also required some $700-million in economic-aid from abroad in 2005. The CIA page was last updated on November 15 2007.It's well worth a read. Also relating to the land-distribution issue is the dispute between South Africa and land-locked Swaziland. Its King Mswati has now lodged a claim with the International Court of Justice (in The Hague) to claim large swathes of northern-Mpumalanga and KwaZulu-Natal provinces from South Africa. Nov 17 2007 -- PRETORIA -- Afrikaner singer Steve Hofmeyr and Springbok rugby star Pierre Spies were among the crowd celebrating Pretoria's 152nd birthday on Saturday. 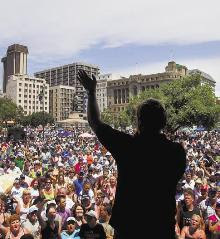 The Afrikaans music-fest was held around Paul Kruger's statue on Church Square. Rapport newspaper writes that some 10,000 people attended, many in family groups. The party also was held to highlight the ANC's unilateral decision to rename the Boer-Republican city to "Tswane", the name of a ceremonial bull according to the Afrikaners. The ANC claims the name would honour a historically-murky clan-leader who had been given refuge from tribal warfare at a Christian mission station several hundreds of miles away from the region. Three new Afrikaans protest songs were staged, written specifically for the occasion. Spies -- one of the Springboks who recently brought the World Cup to SA -- also delivered a rousing message. In an earlier meeting between Afriforum and Pallo Jordan, the ANC's Minister of Arts and Culture, Jordan promised the Afrikaner delegates that 'the capitol city of South Africa is named Pretoria. And Potchefstroom is Potchefstroom." The Afrikaner delegates who were given this undertaking were Solidarity trade union leader Kallie Kriel, Alana Bailey of AfriForum, singer Steve Hofmeyr and Theo Venter of Action-Potchefstroom - one of the many traditional Boer-towns in South Africa which are also facing the name-change axe. Jordan also undertook to ask the Pretoria metro-council's mayor Dr Gwen Ramokgopa to 'start negotiations and consultations with Afriforum to try and find solutions for the Pretoria-name dispute'.Thus far, the mayor has ignored all requests for meetings with Afriforum. Jordan also took note of the documents they gave him about a recent court decision disallowing the planned name-change for the Voortrekker-founded town of Louis Trichardt. The Afrikaners told the ANC-Minister that they would use all the necessary legal steps to retain their Constitutional-cultural rights to maintain the old Boer-names in these towns and cities which were founded and developed by their Voortrekker forebears.